NAT Holepunch or HTTP Tunneling. 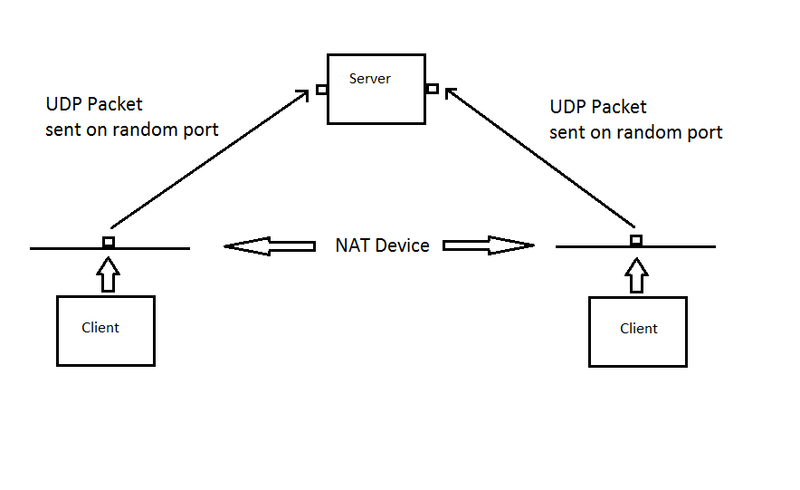 Problem: A lot of NAT devices permit receiving UDP packets, but sending them. That's why we can send packets to a server who can listen on all UDP ports and accept our request. At first the relay server is listening on a pre defined port for incoming udp packets. Computer A tries to send a UDP packet to this server. 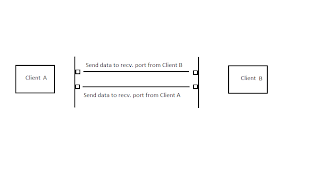 The packet contains information about connection details of the according peer Computer A would like to connect to later. 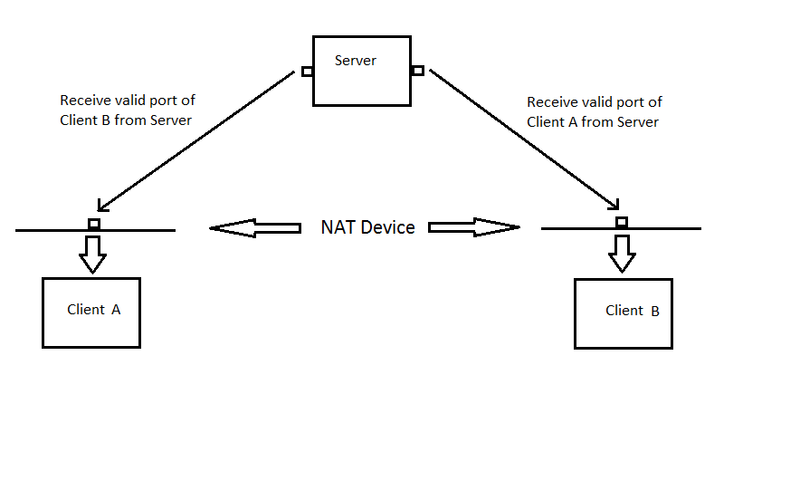 The relay server gets the packet and remembers the senders IP + UDP port and the packet content for later requests by Computer B. Now Computer B sends a UDP packet to the relay server with connection details (e.g. IP) of his according peer, namely Computer A. 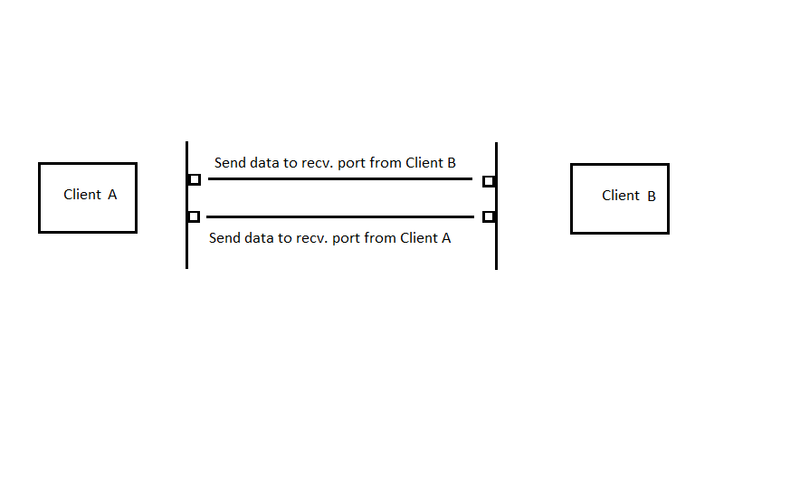 The relay server again gets this request and compares in his list of requests whether the new connection details from the packet match one from earlier saved requests. 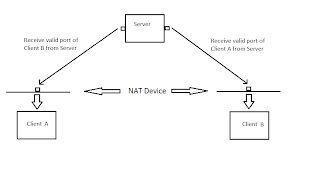 If thats the case the server sends out to both peers each others connection details to the open ports earlier received of them. 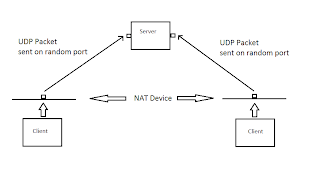 Now Computer A sends UDP Packets on this open port to the direct peer on his open port and vice versa. If you are behind a firewall your only way to communicate with the outer world is to use port 80, which is used for all http traffic (when you are browsing the internet). In this case HTTP Tunneling comes into play. 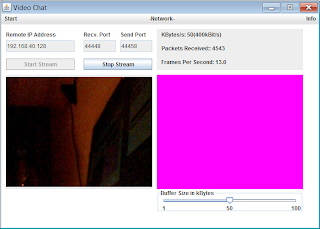 We use HTTP to send the video stream to the other peer and vice versa. That means both parties have to have a listening webserver on port 80. Originally RTP Packets are sent via UDP as underlying protocoll. Due to the nature of firewalls blocking most traffic in general it is not possible to stream your UDP packets to another location. The solution is to use the only free port (80). This opens another problem. In contrast to RTP HTTP works with TCP/IP as underlying protocoll. This means we have to deal with packet retransmission and therefore delays in the reception of the data. One solution would be to implement the common known HTTP Streaming. This works the way that you have split your stream in time equavilant segments and send these to a webserver, which serves these files. Now the client connects to the webserver and reads one file after another. Bad side of this method: It is not real time anymore. Due to the creation of the files the client has to wait at least the time the server needs to capture one segment and load it onto the webserver. 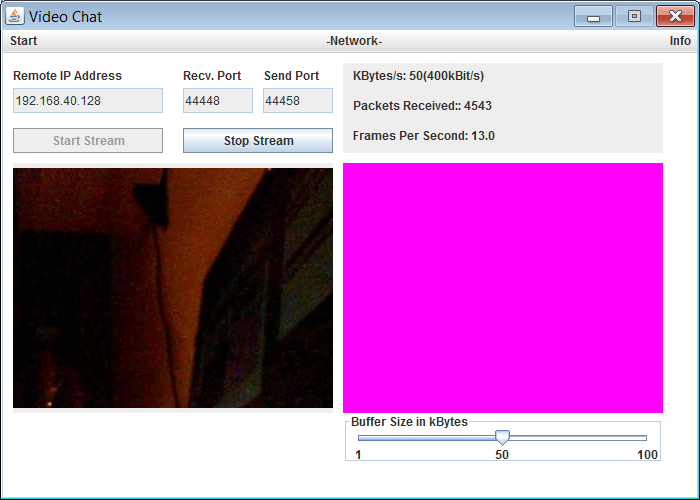 Result: Depending on your webcam it will work! I am trying to develop a telemedicine software in java for which i need to establish a video chat between doctor and patient. PLz help me. Hi.. you have made a nice video chat app in java. Could you please upload the source code or mail the source code at ankit.aki@gmail.com?? Hello, I am doing a video Conferencing using Java, can you send me the source code. I am doing a video Conferencing using Java. Please send me the source code.